As we continue our journey through Heroes of the Hidden Week, we encounter Ken Hite’s critically acclaimed Night’s Black Agents. 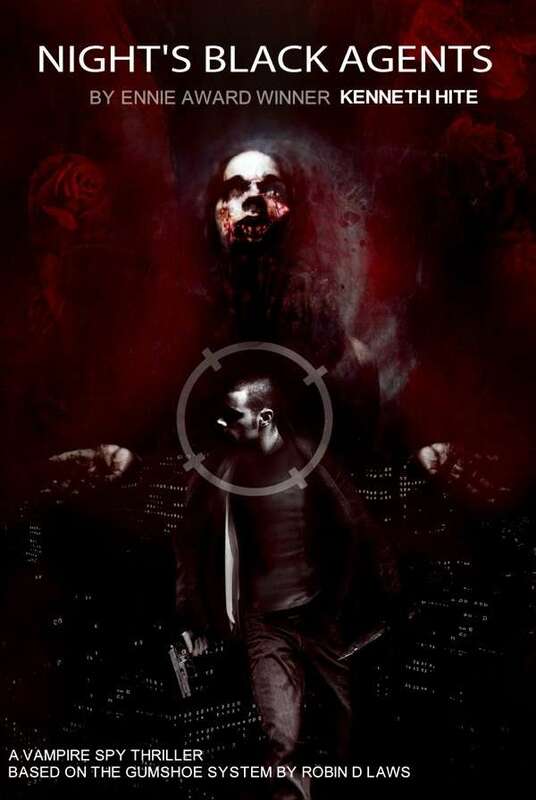 Spies, assassins, agents, and special forces operators find themselves not just pawns in the games played by nations… but games played by the would-be “true masters” of the world – vampires. It’s Bourne vs Underworld, and it’s driven by the excellent GUMSHOE system. As we continue to discover the Heroes of the Hidden this week, we examine a Pathfinder-driven modern world where ancient bloodlines and practitioners of secret magics protect an unsuspecting world from dangers crossing in from many other realms. This is less horror and more urban fantasy, though, as various societies hidden from the average human interact in strange and interesting ways. 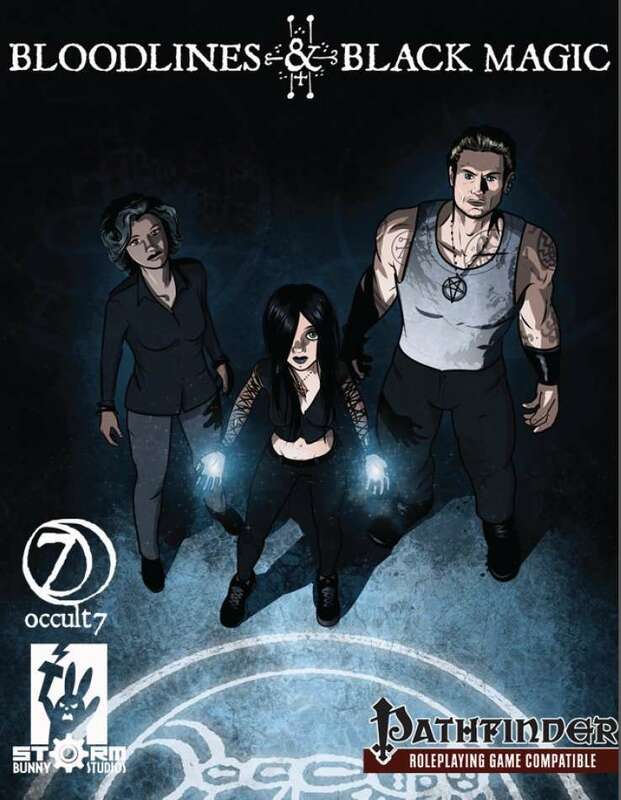 Occult 7 – shortened to O7 throughout this book – is a variant rules system based on the Pathfinder Roleplaying Game. Like much of the core of the Pathfinder Roleplaying Game, O7 is a game of enigmatic heroes who rise up against terrible dangers and overcome powerful, diabolical and earth-shattering foes. However, instead of using Pathfinder’s usual 20 levels of character progression, O7 uses only the first seven levels. This keeps characters in the “sweet spot” of adventuring. They are tough enough to take on the darkness but are still manageable. Adapted from the Epic 6 rules variant, O7 is designed specifically for Bloodlines & Black Magic and is intended to work with the classes presented in both Pathfinder Occult Adventures and the Pathfinder Advanced Class Guide, both of which are suggested for this setting. Celebrating Heroes of the Hidden Week, we take a look at this Powered by the Apocalypse game where a heroic few protect the unknowing world from the many monstrous and supernatural threats out there. 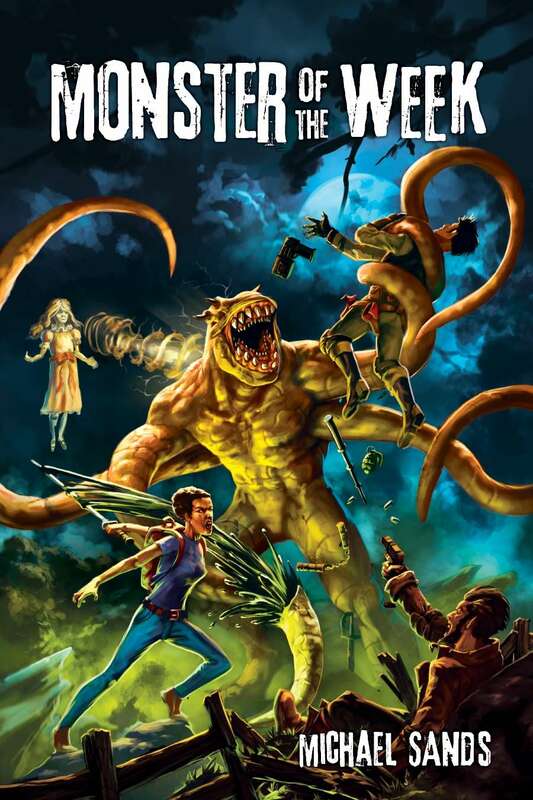 Monster of the Week is Buffy, the Winchester boys, Mulder, and Scully doing all they can to stop humanity from (a) finding out about monsters and (b) being eaten by them. Time to sign up for the hardest and most thankless job there is. 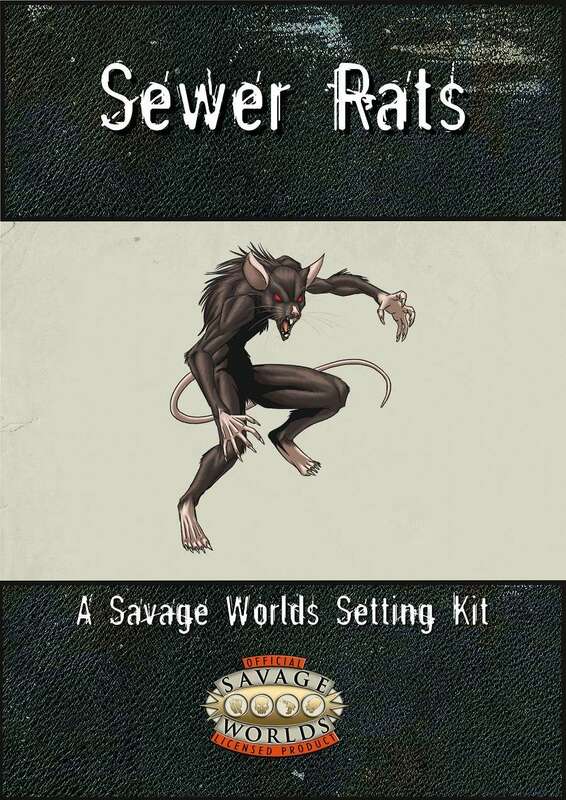 Today’s Pick, a fun “Setting Kit” for Savage Worlds from Tricky Troll Games and Nathan Carmen called Sewer Rats, inspires this week’s theme – Heroes of the Hidden. In this case, mutant animals living beneath the city streets, plotting revenge against an evil megacorp while the world above remains oblivious. According to Nathan, it’s “inspired by the original, grittier Teenage Mutant Ninja Turtles comic, and the 90s TV show Gargoyles.” Figure that’s going to scratch a few creative itches out there, and the reviews are very favorable. In an alternate modern-day earth, a villainous corporation known as Evolved Technologies Inc. has begun abducting humans and turning them into freakish mutants. Now, these mutants are escaping and living in large numbers beneath our feet, plotting revenge against ETI while trying to survive the urban jungle. This Setting Kit provides a toolkit full of Savage goodness for the Gamemaster to use as they wish. This format is designed to highlight just how much a group can do with the Savage Worlds Core Rules and a little tweaking. 3 New Races which can be adjusted to create a variety of animal, demon, and human-like mutants. 26 Mutants, Villains, And more! Closing out Sci-Fi Adventure Week, I decided to focus on a set of tools you will enjoy using to craft your own “galaxy far away” kind of campaign or adventures. 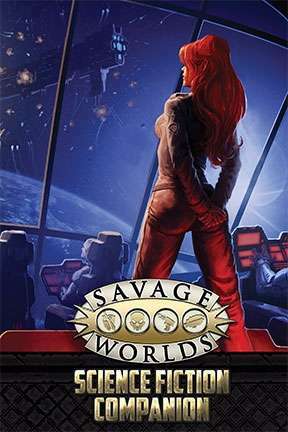 Savage Worlds works really well for science-fiction, and especially if you have the Science Fiction Companion. It covers new character creation stuff, sure, but it’s all the sci-fi featured gear and customization rules thereof – cybernetics, mecha, weapons, starships, and more. Of course, Pinnacle has a couple of great settings that feature all of this material heavily – Fear Agent and The Last Parsec. 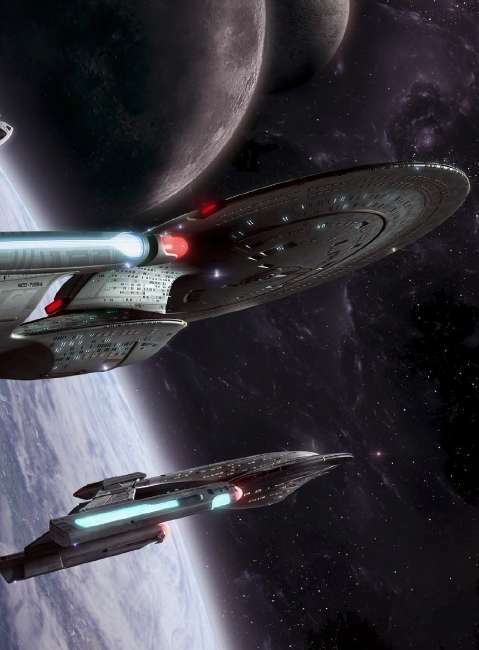 When it comes to pure science fiction adventure, no name stands out more than Star Trek, and Modiphius has crafted what many feel is the single greatest presentation of that setting for gaming ever – Star Trek Adventures. This collection contains everything they’ve published so far, and also signs you up for everything yet to come, so if you’re a “give me everything for a decent price” kind of collector, here you go. If you just want to core book, here’s your link for that. Onward through Sci-Fi Adventure Week! The PDF Collection includes the PDFs of 9 books in the Star Trek Adventures line due out in 2017 and 2018. As Sci-Fi Adventure Week warps along, we check out the Powered by the Apocalypse entry in the field garnering serious attention, Uncharted Worlds. This one mixes one part Serenity/Firefly, one part Star Trek, and one part Star Wars with three parts narrative-driven science-fiction. For the AWE fans out there, I suspect this is the no-brainer. 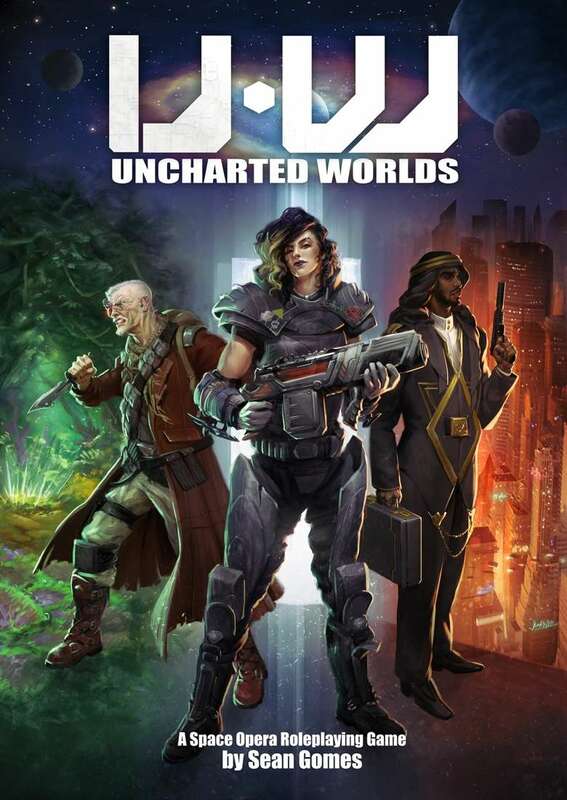 Uncharted Worlds is a space opera of discovery and adventure, which explores a universe full of deadly beauty, hostile frontiers, rapacious organisations, and crippling debt. It’s a story-building game where dramatic encounters drive the narrative ever onward, building a solid, memorable universe that’s unique to each group. If you want to pilot your ship across the reaches of space, be the first human to make landfall on alien shores, bring back hard-won exotic cargo, deal with galactic corporations, go toe-to-toe corrupt empires and rebel scum, face down ruthless pirates (or perhaps engage in a bit of interstellar piracy yourself)… then strap yourself in, disengage your mooring clamps and prepare for one hell of a Wild Jump. Also available – Uncharted Worlds: Far Beyond Humanity, the expansion to Uncharted Worlds. As we blast on through Sci-Fi Adventure Week, we note the newest version of Stars Without Number is tearing up the sales charts. 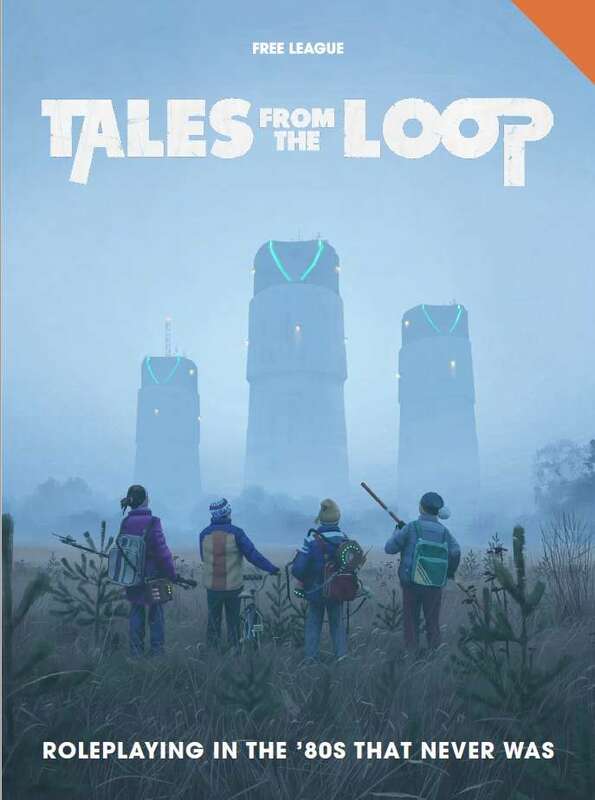 Arguably the most successful of all the OSR science-fictions games, this newest iteration still calls back to the glory days of science fiction gaming where jumping into a ship and just seeing what’s out there was the major reason to sit at the table. Interstellar nation building, transhumanism, giant war machines, and “space magic” are all part of the offerings. 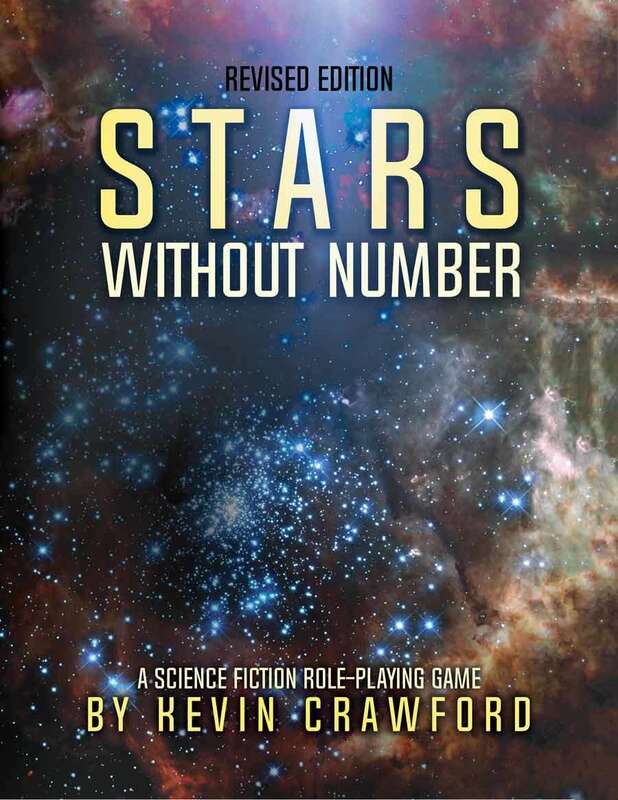 Stars Without Number: Revised Edition is an old-school-inspired game of sci-fi adventure, one built from the ground up to encourage sandbox play and simplify a GM’s job in providing it. Familiar mechanics are employed to forge new worlds and explore new possibilities, guidelines built on long experience used to help a group venture in wholly new directions. Within the full-color pages of Stars Without Number: Revised Edition, you’ll find… . Refined psionics, with more options to distinguish your psychic hero’s powers and more flexible choices for their abilities. Tailor your psychic to your concept, whether as a cynical gunslinging brainguard or an ascetic psychic healer from a world of austere psionic scholars. Upgraded tools for sandbox sector creation, with forty new world tags to help define a GM’s stellar creations, guides for adding additional system points of interest, and material to help a GM define the interesting traits of the worlds they create. These tools aren’t just a clump of random tables, they’re a framework to boost your own creativity and help you make fast, good, playable material for your game. Augmented adventure creation guidelines. Aside from a hundred piping-hot adventure seeds that mesh smoothly with the world creation tools, Stars Without Number: Revised Edition also includes content to help you turn your vague ideas into a playable evening’s adventure. Guidelines on challenges, rewards, and complications in play are all aimed toward the working GM, the man or woman who’s not just theorizing their adventures, but actually responsible for making something fun for the whole group. Tools for creating aliens, Virtual Intelligences, and hostile human foes, with guidelines for handling potentially-hostile encounters and creating the kind of fearsome xenobeasts that can challenge the doughtiest explorer. Or perhaps you want to be an alien or robot? You’ll find the tools for that in Stars Without Number: Revised Edition. Society creation, customizing a world or a hab with its own culture and history, pre-designed with fault lines and conflicts to engage your heroes. You’ll get more than a dry recounting of details; you’ll get the information you need to build adventures that fit with this world’s smouldering tensions. I’ve really been enjoying The Expanse (just finished the second season on Amazon Prime), which is a pleasant surprise to me. In the past, I’ve not always been as strongly attracted to “hard” sci-fi; I suppose my palate has matured? At any rate, I’m calling this Sci-Fi Adventure Week and opening up with a great 5E-driven entry called Esper Genesis. 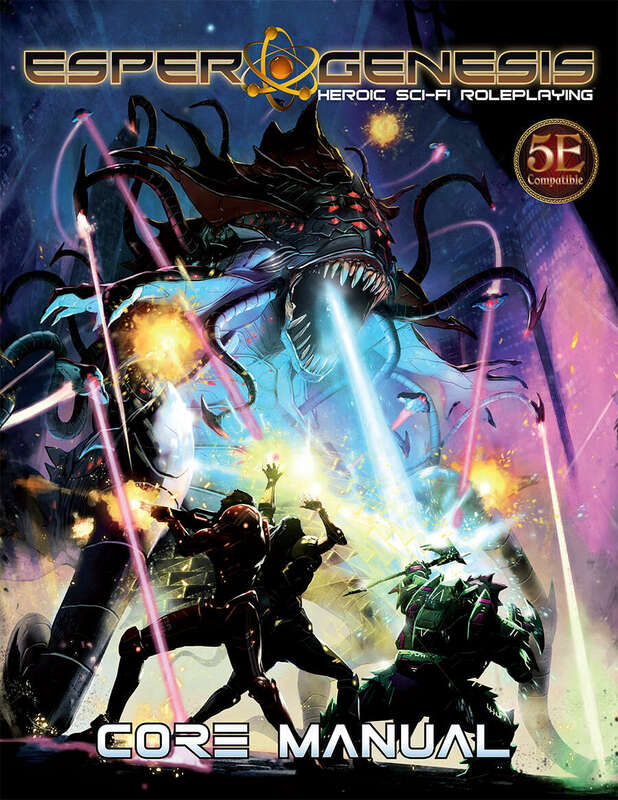 Galaxies at war, high-tech gadgets and weapons, robots, aliens, starfighters, and ancient machines with the power to shape reality – All of these make the core of Esper Genesis, powered by the 5th Edition rules of the world’s greatest roleplaying game. Taking on the role of a galactic hero, you can forge your destiny within a universe of advanced technologies and hidden mysteries. Remember to pick up your free download of the official ESPER GENESIS CHARACTER SHEET and the GAME MASTER BASIC RULES, which include sci-fi threats, special item enhancements, and setting development aids. Visit the official Esper Genesis homepage at espergenesis.com for project updates, gaming events, and special offers.